Peter Schmidt: chairman of the Molotschna Mennonite Agricultural Association and chairman of the Molotschna Mennonite School Council; born 23 October 1817 in Steinbach, Molotschna Settlement, South Russia, the second of twelve children of Peter Daniel Schmidt (29 November 1789 – 12 May 1856) and Anna (Wiens) Schmidt (20 March 1796 – 4 November 1870) (daughter of Klaas K. Wiens, the founder of the Steinbach estate). He was a brother of Nikolai Schmidt, founder of the Templer movement among the Mennonites. Peter married Marie Martens (8 October 1821, Halbstadt, Molotschna Settlement, South Russia – 30 October 1895, Steinbach Estate, South Russia) on 3 March 1842 in Steinbach, Molotschna Settlement. She was the daughter of Wilhelm Aron Martens (31 December 1781 – 10 June 1845) and Justina (Willms) Martens (7 September 1795 – 24 February 1828). Peter and Marie had ten children, with the youngest five living to adulthood: Anna, Maria, Peter, Nicolai, and Katharina. Peter died 11 May 1876 on the Steinbach Estate, South Russia. Peter owned and lived on the estate Steinbach, where he had his office. He established a secondary school on this estate, taught by Peter Neufeld. 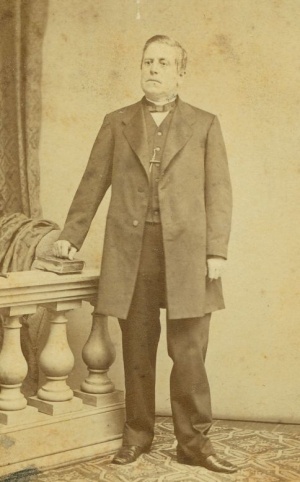 Peter Schmidt was very influential in the cultural life of the Mennonites of the Molotschna settlement, and served as chairman of the Molotschna Mennonite Agricultural Association from 1850 until 1869. Son Peter Schmidt (1860-1910) was an elder of the Steinbach congregation in the Molotschna Settlement. GRANDMA (The Genealogical Registry and Database of Mennonite Ancestry) Database, 5.00 ed. Fresno, CA: California Mennonite Historical Society, 2006: #65161. Krahn, Cornelius and Richard D. Thiessen. "Schmidt, Peter (1817-1876)." Global Anabaptist Mennonite Encyclopedia Online. February 2007. Web. 25 Apr 2019. http://gameo.org/index.php?title=Schmidt,_Peter_(1817-1876)&oldid=163038. Krahn, Cornelius and Richard D. Thiessen. (February 2007). Schmidt, Peter (1817-1876). Global Anabaptist Mennonite Encyclopedia Online. Retrieved 25 April 2019, from http://gameo.org/index.php?title=Schmidt,_Peter_(1817-1876)&oldid=163038. This page was last modified on 13 January 2019, at 18:53.